Badminton Malta has won the bid to organise the ISF (International Sports Schools Federation) Badminton World Championships in March 2016. In this regard Badminton Malta felt the need to have a mascot/logo of its own for this unique event. Hence we are inviting interested individuals to submit their proposed mascot/logo design by not later than the 30th November 2015. The CMYK of any colours used should be clearly specified in the e-mail. Any fonts used should also be attached with the e-mail. Each participant can submit more than one logo. Ideally, the mascot/logo should be easily adapted to one-colour whenever necessary. A touch of Malta should feature in the logo. Participants should also consider providing the design of the mascot/logo in both vertical and horizontal format, though stating their main logo (refer to diagram below for an example). BM will choose the winner of the competition by the 10th December 2015. The decision of BM regarding the winner of the competition will be final. Members of the BM Committee will be able to take part in the competition, but they will not be eligible to win the prize. The prize would be given to the runner-up of the competition, should the mascot/logo of a member of the BM Committee be chosen. All submitted logos will be fully owned by Badminton Malta and Badminton Malta reserves the right to modify, and make use of the mascot/logo as it might deem fit. The winner could also be asked to provide up to 3 variations of this same mascot/logo. The prize, an Apple iPAD Mini, has been kindly sponsored by AtoZ Electronics. 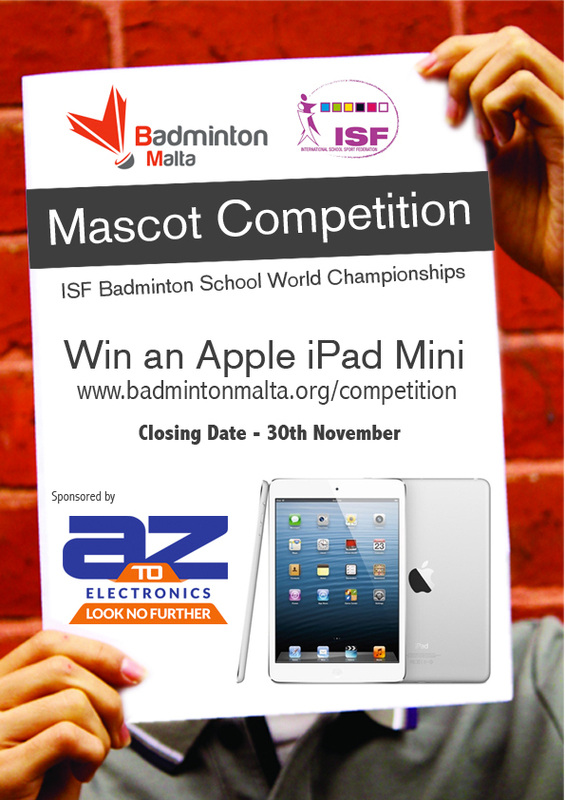 Should you have any questions regarding the competition please contact Jo’Anne Cassar on gensec@badmintonmalta.org.